Are you taking your relationship for granted? Don’t sabotage a good thing with bad behavior – learn how to avoid taking someone for granted in a relationship with small, meaningful acts that build strong foundations for lasting happiness. This can be disastrous for relationships. In fact, “lack of appreciation” is frequently cited as one of the most common reasons for divorce. 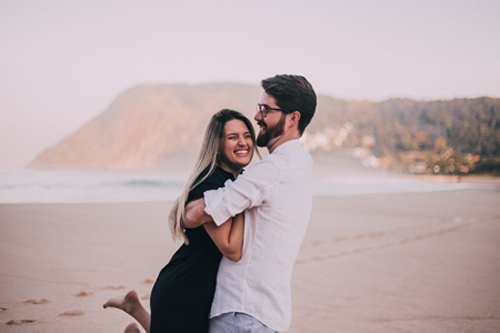 The good news is – it’s easy to intentionally start expressing more gratitude for your partner and in the process build a stronger, happier relationship. So, maybe you’re wondering “What does it mean to take someone for granted in a relationship, anyway?” It simply means we stop noticing and expressing our thanks for the things they do. We stop showing our appreciation. Maybe it’s cleaning the house, or buying groceries, making dinner, or recording our favorite show, little things our partner does that we used to be so grateful for, we just stop acknowledging. You can stop taking your partner for granted in a relationship by following some key tips to a healthy relationship. When we’ve been with someone for a long time, the newness of the relationship eventually wears off. Things that once came so naturally, like planning fun date nights, or surprising our partner with a gift, or giving them loving compliments, these things start to slip away from us. Often, it’s the result of our attention shifting to other areas of our lives – like work and financial obligations. We don’t mean to make our partner feel unappreciated. We’re just overwhelmed with responsibilities and unaware of the way our actions are affecting our partner. Make it a point to give sincere thanks for the things your partner does for you. Change up your routine. Swap chores and make it fun. Give your partner compliments – both publicly and privately. Find opportunities to surprise your partner with small gifts. These can be something you’ve made or even a note of appreciation left in a pocket. These spontaneous surprise reminders of gratitude will help you and your partner have a deeper connection. With a little intentional effort, we can stop taking someone for granted in relationship situations – even if we suddenly realize we’ve been failing to express gratitude for our partner for quite some time. Acknowledging the problem is the first step. A good second step is having an open, loving conversation with your partner. Express thanks for all they do and apologize for not having shown more gratitude in the past. Taking someone for granted and losing them is a hard lesson to live with, and one that happens all too often. If you know you have been taking someone for granted, take immediate steps to fix the situation before it’s too late. If you need some inspiration to motivate you to show your partner more gratitude, here are a collection of quotes about taking someone for granted in a relationship. Read them with open eyes! When we take our partner for granted we risk ruining our relationship. Yet, it’s not an uncommon theme. So many breakups are the result of one or both partners feeling unappreciated. Once the feeling of being unappreciated sets in, it’s easy to start forming resentment and feelings of anger and sadness. Recognizing when this is happening is the first step to correcting it. With conscious effort, you can learn how to stop taking your partner for granted in a relationship. If you want a lasting, loving relationship, gratitude and appreciation are essential ingredients. Having experienced some of the highest highs and lowest lows along his journey to success, Dhar Mann has been able to help others push through the barriers and address the challenges that hold them back. On social media, his videos have been shared millions of times and viewed tens of millions of times. You can stay connected to and up to date on new weekly content aimed at helping you live your best life by subscribing to his YouTube channel or following him on Facebook. This is definetely a must read, i shared it on my facebook page. I think also that learning your partner’s love language is SUPER helpful! For example, I prefer quality time together – that’s my FAVORITE thing my husband can give me. But he LOVES getting small gifts (especially technology related). He will sometimes give ME tech-gifts, and while they aren’t top of my list, I know that for HIM, they are really special – so he’s trying to show his love. If you don’t know each other’s love language, you can be doing things that YOU think show your love but the person doesn’t FEEL loved/connected because they prefer a different love language. In any case, showing appreciation and saying “thank you” is always important – no matter how long you’ve been together! I would love to use this money to save up for a 3 day weekend trip for later this year when my boyfriend returns from deployment. By the time he returns he’ll have been gone a year. We’ve been together for about 1.5 years and I’ve never gone through a deployment with him before. Bills are tight with him being gone and we can’t save for a trip where we can reconnect after he’s been gone for so long. I just know me surprising him with a small trip would mean to the world to him once he returns. A good tip from the buzzfeed article is not to feel bad if you let an opportunity that doesn’t feel right go, there’s no shame in it and it’s probably what’s best at the time. Where one door closes, another one opens. Thank you again for the giveaway opportunity! Simple heartfelt gestures go a long way in a relationship. This was one of the first birdies I watched of yours and I absolutely loved it! Like I said in the other post I would treat my boyfriend to a nice dinner and buy some affordable things for his apartment. I watched this video again and it made me want this prize even more because I agree with your so much. Sometimes we get caught up in our work problems or other things that we forget to show our S/O how much we love and appreciate them. I try my best to show not only my boyfriend but my family as well. We have to treat others how we like to be treated! This one hit me hard, at times I feel unappreciated but then I think of all the things my husband does that I also take for granted. Communication is key. It would be an absolute blessing to be chosen for this giveaway. There is so many people on here who this would bless greatly as well. I pray it’s me, but I wish everyone luck. In all truth this gift would help my family so much at this moment, and I thank you both for just giving us the opportunity.